Text Anywhere 2-Way Communication On The Go! 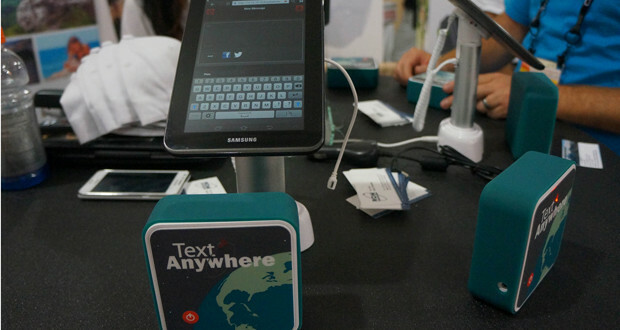 Text Anywhere 2-way communication is a personal text messaging hotspot for use with compatible Wi-Fi enabled smart phones, tablets, laptops and computers. It is Apple, Android, Blackberry and Microsoft friendly. Also giving you the ability to stay socially connected with the ability to post to Twitter or Facebook. It comes with an on board web application that eliminates the need for a special app or additional hardware. Text Anywhere provides true global satellite coverage and true 2-way communication. There are no contracts and is great for adventurers who are in remote places with no cell service. When you need the service it is just a $35 one time activation fee and then $29.99 per month for 100 messages, which is cheaper than cell roaming. The Text Anywhere device is compact at only 4” and runs on either standard AA batteries or vehicle power adapter. The Text Anywhere device is a great way to know that you will truly stay connected no matter where you are. With only 8% of the world having cell service there are many places in which Text Anywhere will come in handy. 2. Select Text Anywhere as your Wi-Fi network and open your browser to access the built-in web page application.